When Scott said he would grill this salmon for me, I was tempted to use a barbeque sauce but decided to try this dry rub instead. I am glad I did. It was so good!! It is a perfect combination of sweet and spicy. I added a little garlic powder to this but didn’t measure it. I didn’t get a good picture of it but the recipe is very blogworthy! 2. Combine salt and next 7 ingredients (through cinnamon); rub salt mixture over fish. 3. 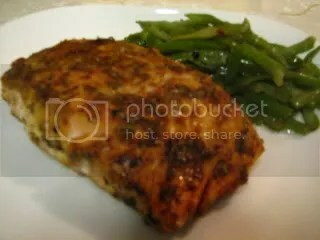 Grill fish for 10 minutes or until fish flakes easily when tested with a fork or until desired degree of doneness. mmm, this sounds great! I am always looking for new ways to prepare salmon! This sounds really good! I never would have thought to use cinnamon!